URAYASU, CHIBA—The groundbreaking ceremony for Oriental Land Co., Ltd.’s new project, a permanent Cirque du Soleil theater, took place on April 18, 2006 at Tokyo Disney Resort. The ceremony began at 10 a.m. at the site reserved for the theater next to Disney Ambassador Hotel. Representatives of Takenaka Corporation and Oriental Land Co., Ltd. performed the groundbreaking in the presence of a Shinto priest from Seiryu Shrine. Traditional Japanese rituals also took place to pray for safe completion of the building. A total of 47 people related to this project attended the ceremony. 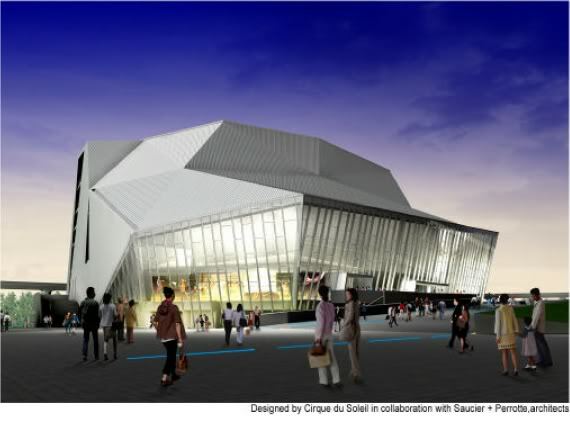 The permanent Cirque du Soleil theatre is scheduled to open in fiscal year 2008. Statement from Yoshiro Fukushima,President and COO of Oriental Land Co., Ltd. The groundbreaking ceremony for our permanent Cirque du Soleil theater took place on April 18, 2006. This exciting project is scheduled to be completed in 2008. It is our honor to present in Tokyo Disney Resort, Cirque du Soleil’s first permanent theatre outside North America. Cirque du Soleil creates thrilling performances that challenge the limits of human capability, transforming it into Art. Creation of an original show for this theater has already begun and we are sure that it will deliver even more wondrous entertainment to guests visiting Tokyo Disney Resort. The opening of this theater in fiscal year 2008 will coincide with the 25th anniversary of Tokyo Disneyland Park and the grand opening of Tokyo Disneyland Hotel, thus further enhancing the appeal of Tokyo Disney Resort. It is with great pride and honor that Cirque du Soleil is present today for this unique and unprecedented event in its 22-year history. For the first time ever, Cirque du Soleil will have a permanent home outside North America dedicated to its loyal and devoted fans in Japan. We have designed a theatre that will pay tribute to the unwavering loyalty of our audiences and reflect some of the attributes at the core of Cirque du Soleil’s creative impulse: transparency, clearness, youthfulness, energy and strength. The design of the theatre will harness the energy of the sun to warm audiences’ hearts. A timeless symbol of youth, the sun has been a constant source of inspiration throughout our history and our shows. It will be the driving force for creators, performers and employees involved in this new project. Today’s ceremony marks an important step in the creative process of this new project. It is the beginning of the journey leading to an unparalleled production to open in 2008—a shining testament to the loyalty and dedication of our Japanese and international audiences. “In 2008, the curtain will rise on a partnership that combines the artistry of Cirque du Soleil, the creative energy of Disney and the vision of the Oriental Land Company,” said Nick Franklin, President of Walt Disney Attractions, Japan. ça va se trouver à côté du Disney Ambassador Hotel, c'est à dire sur son parking ? Des nouvelles . . .
Selon cette interview, la direction et composition musicale du Show est revenue à René Dupéré à qui on doit une majeur partie des bandes sons des spectacles du Cirque dont la plus connue et la plus vendue, Alegria, ainsi que la musique de la cérémonie de rétrocession de Hong-Kong à la Chine. C'est donc une très bonne nouvelle puisque c'est une pointure en la matière, qui a fait ses classes au cirque, et qui m'évoque toujours avec nostalgie les années Dragone (80's et 90's). Bien sûr sa récente collaboration avec le cirque pour la trame de Kà nous a montré qu'il n'a rien perdu de son talent, puisque le ton épique/cinématographique de la musique est une vraie réussite. Bonne trame sonore en perspective. En ce qui concerne le thème, c'est celui du ciel qui revient le plus souvent et qui circule sur le net. Ce qui est sûr, c'est le nom du metteur en scène, François Girard, naturellement québécois, scénariste et réalisateur ayant reçu plusieurs prix. Kooza lancé, on peut espérer avoir beaucoup plus d'info prochainement sur ce projet puisque je pense que les répétitions et entrainements ne devraient plus tarder au Studio (du moins s'intensifier) car il y a fort à parier que le processus de création est déjà bien entamé (2008 s'approchant). La mise en place et montage du spectacle avec la troupe ne devraient donc plus tarder. Mais attention, au cirque, tout peut changer rapidement, même dans la semaine précédant la première ou la cage aux lions. En effet le rythme de travail est intense et les délais sont très court pour le montage final. Un seul mot du grand patron est tout à reprendre ! Viens là que je te flagelle Yao, vu la fausse joie que tu viens de me faire. Je vois Alegria en 2008, je me dis "je vais enfin pouvoir aller les voir et là je vois la section Tokyo et Hong-Kong, t'es vraiment mechant. Viens là que je te flagelle Yao, vu la fausse joie que tu viens de me faire. voir et là je vois la section Tokyo et Hong-Kong, t'es vraiment mechant. Désolé, par contre Delirium passe à Paris Bercy le 31 Mars & 1er Avril 2008. Pour en revenir au projet de Tokyo après toute les nouvelles postées ci-dessus, sachez que le carnet de commande est bien rempli : Luxor (Vegas) 2008, Macao 2008, Elvis 2009 (Vegas), Macao 2009, Dubaï 2010, Hollywood 2010 (Kodak Theater). Bref le show de Tokyo s'inscrit dans une forte croissance des activités de l'entreprise où l'europe n'est pas concernée. En ce qui me concerne j'ai vu 3 spectacles en vrai (Mystère, La Nouba et Alegria)et Ka sur Arte à Noël dernier. Ordre de préférence: Mystère, Ka, La Nouba, Alegria. Mais de toute façon, chaque spectacle est une merveille en soi et j'espère avoir un jour la chance de retourner à Tokyo Disney pour découvrir celui là. Il s'agit de Charivari et The Worlds meet. Personellement je suis déjà fan, surtout de la seconde (en cirquish me semble-t-il), vivement le CD. René Dupéré semble encore avoir fait des merveilles ! Petit Up étant donné que le nom du spectacle a été dévoilé, il s'agit de "ZED". URAYASU, CHIBA (JAPAN), June 3, 2008 – Oriental Land Co., Ltd. and Cirque du Soleil are pleased to announce that “ZED” will be the title of the new original show to be performed at the Cirque du Soleil Theatre Tokyo, which will open at Tokyo Disney Resort® on October 1, 2008. ZED is a living poem, a timeless evocation that draws on the Tarot and its arcana, an imaginary world that conjures the vitality of the human condition and holds up a mirror to our true selves. The central, larger-than-life character Zed represents all of humanity in all its guises, from wisdom to folly, from discovery to adventure. Zed grows as he discovers the world on his journey of initiation. Through this undertaking the people of the sky and the people of the earth are trying to connect with each other; through Zed, they come together. The world of the arcana, in which ZED finds its inspiration, teems with life and vibrant characters, including the Great Goddess, The Fool, The Sphinxes and the Satyrs – all engaged in a lyrical odyssey to the heart of the human experience. • This number may not be accessible from some cell phones, IP phones or overseas numbers. • Hours: 10:00 a.m. – 5:00 p.m. Closed during the year end and New Year’s holiday. • The above hours are subject to change without prior notice. To establish the set design concept, designer François Séguin started with a form inspired by the astrolabe. His underlying intention was to fill the whole stage as if it were a frame from a film, and in terms of aesthetics, his design evokes the High Renaissance and the Mechanical Age. Brass and copper components, precision engineering, painstaking craftsmanship and scientific ingenuity combine to create the impression that the audience is actually inside – and sometimes outside – a complex mechanical astrolabe floating in space. The set takes its inspiration from many eras and influences. Ancient science, the inventions of Leonardo da Vinci, the products of the early days of the Mechanical Age, nautical instruments and astronomy all play a part in creating an atmosphere of solidity and tradition, floating in a space that looks toward the future. Diderot’s Encyclopedia, which began to be published in 1751, also informed the designs. "Diderot, the first French encyclopedia, codified knowledge and is filled with images of mechanical devices," says designer François Séguin. When the audience first enters the theatre, the set is wrapped in a large sheet and the auditorium gives no clues or visual cues as to where they are or where the show is situated. The spectacular imagery is revealed when the cover is whisked away in a sudden, sweeping gesture by a character inspired by The Fool in the Tarot. This dramatic moment instantly plunges the audience into an environment that recalls antique astronomical and navigational instruments set in an ancient cosmos that is at the same time new and somehow familiar. In keeping with the physical dimensions of the theatre and the themes of the show (in which one community of characters inhabits the sky and the other community is earthbound), the set emphasizes verticality as a visual reinforcement to the narrative, as well as meeting the demands of the show’s acrobatics. While the materials are unquestionably rich, the colors – suggesting an antique patina of burnished metals and polished wood tones – are intentionally somewhat monochrome and muted, and the look is quite dark, reminiscent of 19th century interiors. The objective is to focus more attention on the performing artists than on their surroundings. Since this is a Cirque du Soleil show, the set must also accommodate a large amount of acrobatic rigging, lighting and sound equipment, and designer François Séguin decided to integrate it into the set as much as possible, rather than impose it on the décor. His design minimizes the visibility of all the winches, rigging, cables and the setting up needed to perform complex acrobatic numbers. • Made mostly of steel, the suspended astrolabe weighs 19, 504 kg (43,000 lbs). • The enormous 10m globe, which can move vertically, is decorated with meridians and parallels and fitted with a net that can deploy and retract as needed. • Winches hidden inside the globe are used to transport the artists, stage equipment and acrobatic equipment throughout the show. • On the floor of the stage, there is a representation of the Milky Way and symbols referring to the different phases of the moon. • A door leading under the stage is installed inside a book that the clowns Oulaï and Nalaï find at the beginning of the show. When they open it, they plunge inside, literally engulfed by the pages. • The Vortex, the white canvas that wraps the stage at the start of the show, comprises more than 5,600 square meters of material. Two motors pull it at a speed of six meters per second, making the entire surface vanish in 25 seconds. • During the Birth of the Sky scene, the set features a firmament of thousands of stars. To achieve this effect the vault of the Astrolabe is covered with 3,500 LEDs and the floor of the stage has more than 900 fiber optic points of light. • An alphabet of 26 symbols, The Zed Alpha, was created for the production. It appears in the set design and shows the periodic table of the elements as well as words related to components of the show. • Five spheres of various diameters, each displaying its own special effects, form a miniature representation of the Astrolabe – a micro world that reflects the macro world. Une vidéo de la conférence de presse est visible à cette adresse. Le teaser est lui à cette adresse. Et un reportage de Radio-Canada ici. The Cirque du Soleil Theatre Tokyo is the resident theatre designed exclusively for ZED, an original Cirque du Soleil program that will be shown only in Japan. Until now, resident shows have been limited to North America; for its first such show in Asia, Cirque du Soleil has spent the last three years building this theatre while developing the story of ZED. The stage was designed to complement the dynamic performances in the show: the colossal set, which evokes the celestial sphere, was inspired by the astrolabe-the classical instrument used to locate and predict the position of the Sun, Moon, planets and stars—and extends well into the seats, allowing the audience to feel more a part of the show; this, combined with the specially-devised acrobatic equipment, will make for an amazing Cirque experience on a grand scale. Japan has never seen anything like it! "The scenic atmosphere of ZED evokes the pinnacle of the High Renaissance and the dawn of the Mechanical Age." Set designer François Séguin’s concept was inspired by the astrolabe, which was used for astronomical observation before the invention of the sextant. Wanting the stage to be as impressive as a movie scene, Séguin drew upon themes evoking the flourishing of the Renaissance and the Mechanical Age. In the theatre, brass and copper components, precision engineering, elaborate craftsmanship and scientific ingenuity combine to create the impression of being inside—and sometimes outside—a complex astrolabe floating through space. Séguin’s inspiration came from many diverse sources: ancient science, the inventions of Leonardo da Vinci, devices produced in the early Mechanical Age, nautical instruments and astronomy come together to create the duality of a rigid, traditional world and the sensation of travelling through space towards the future. The “Zed Alpha,” an alphabet consisting of 26 original, distinctive symbols, was created especially for the show. The set design includes these symbols scattered across the stage, a visual representation of both the periodic table of chemical elements and the language of the show. The gigantic globe floating above centre stage shows the meridians and lines of latitude, while on the floor, we have the Milky Way and the symbols of the Moon’s phases. mais aussi au sujet des numéros (voir ici) et des personnages (voir ici). En tout cas je trouve la salle magnifique. En effet, j'adore la salle et la scène. En un mot : astronomique ! 2 nouvelles vidéos viennent d'être mises en ligne sur le site officiel de Zed. L'une est dédié au théâtre & à la scène, l'autre au spectacle (mais c'est en Japonnais). En revanche on entend en fond sonnore de nouveaux extraits musicaux du spectacle. Je les trouve magnifiques et j'ai hâte de voir comment tout cela va s'harmoniser dans le show! Alors qu'à Las Vegas Believe semble être assez critiqué, Zed séduit sont public à Tokyo! The Cirque du Soleil show Zed opened Oct. 1 at Tokyo's Disney resort. It's worth the journey to Japan. TOKYO–Just when you think Cirque du Soleil has taken its own unique form of entertainment about as far as it can go, they manage to astonish us once again. Zed, which opened at the Disney Resort here last night, is one of the major works in the company's history and a piece of theatrical magic that is truly worth travelling halfway around the world to see. This time out, the secret weapon is François Girard, the Québécois director best known for such movies as 32 Short Films About Glenn Gould and The Red Violin, as well as his works for the Canadian Opera Company, such as Oedipus Rex and Siegfried. Girard has always had a knack for bringing a total vision onto the stage or screen and filling it with complexity, but I feel that Zed may very well be his masterpiece to date. At first glance, it is not unlike many other Cirque shows, in which a Harlequinesque character goes on a voyage of discovery. In this case, he's a white-garbed figure known as Zed, perhaps a bit of a clown, but also the perfect empty vessel seeking to be filled by life's experiences. Like any fable, Zed is open to a variety of interpretations and Girard is wise enough to make the audience a creative partner in the show, allowing us to find in the journey of Zed everything from a reflection on our interpersonal relationships to a response to the troubled climate in today's political and economic world. Guy Laliberté, the genius who created Cirque du Soleil, instinctively felt that this show should be dominated by acrobatics and that was the sole direction he gave Girard. But what might have become a repetitious series of aerial stunts turns into a dazzling cadenza of variations on the theme of man in flight. The artists of Cirque hurl themselves into the air in a series of awe-inspiring combinations, defying both gravity and variety as well. One soon realizes that what the legendary Cirque show O did for water, Zed does for air. By restricting the basic palette of choices, Girard has been compelled to go for depth in his staging. Set designer François Séguin has sliced into one of those magical spheres from the imagination of Leonardo Da Vinci. The result is a structure of breathtaking grandeur, filled with multiple levels where performers can be displayed. Girard rises to this challenge and positions his artists boldly, letting the musicians and vocalists – too often hidden away in Cirque shows – be highlighted front and centre, while artfully placed actors function as pieces of kinetic sculpture in an ever-changing series of contrapuntal images. The lighting of David Finn is also sheer legerdemain, offering kaleidoscopic fantasies in dazzling hues and textures that provide Girard's images with a tantalizing depth and complexity. And the costumes of Renée April aren't afraid to make bold statements of their own, using pattern and colour to complete these complex pictures. René Dupéré has composed some of Cirque's most memorable scores over the years, but the one for Zed ranks with his very best and the vocal execution of Kevin Faraci and Johanna Lillvik touches it with magic. All of the pieces of Zed are brilliant on their own, but it is in the show's final sequence that they achieve true greatness. Girard gradually adds every single element we have seen all evening, one at a time, until the stage is filled with an astonishing panoply of movement, light, sound and sensation. The old cliché about "seeing your life pass before your eyes" suddenly comes true as Girard brings everything together in a way that is both dizzying and somehow unifying at the same time. Unless Cirque decides to mount a version of Zed on our side of the globe, you will have to go to Japan to experience this jewel. Believe me when I tell you, it would be worth the journey. Et de deux! Après le succès de Zaia en Chine, c'est au tour de ZED de briser la glace au Japon. Le spectacle de François Girard a été ovationné hier soir pour sa première devant le gratin de Tokyo. C'est le matin à Montréal, mais déjà le mode «party» pour François Girard, à l'autre bout de la planète. La première de ZED vient tout juste de se terminer. Il décroche son cellulaire à bord d'un petit auto-bus en direction de la grande fête couronnant le show. Il est entouré de ses artistes et on sent la satisfaction dans sa voix. Les trois ans de travail acharné pour mettre sur pied ZED viennent d'être récompensés. Le premier spectacle permanent du Cirque du Soleil au Japon, un projet de 140 M$, est présenté au coeur du Tokyo Disney Resort. Le metteur en scène avait confiance en son spectacle, déjà montré 45 fois devant public pour le rodage. Chaque fois, ce fut l'ovation. Hier ne fut pas une exception. Plusieurs invités VIP étaient présents, dont l'ambassadeur du Canada, des vedettes locales, des bonzes de Disney et des amis jet-setters de Guy Laliberté. Miki Nakatani, du film Soie, de François Girard, était aussi présente, ainsi que plusieurs médias japonais. Guy Laliberté, contrairement à la première présentée à Macao, était dans la salle. François Girard avait aussi choisi la salle pour savourer son oeuvre, bien assis dans la rangée 9, à quatre pieds de la table qu'il a occupée ces quatre derniers mois pour superviser les répétitions. Il a préféré la salle aux coulisses. «Je travaille pour le public», dit-il au bout du fil, tout en découvrant les lieux du party. "C'est une vraie ambiance de fête, j'arrive dans un lieu que je ne connais pas, je suis un peu perdu!» a-t-il dit, amusé. À ses côtés, Line Tremblay, directrice de création de ZED. «C'est une grande sage du Cirque, qui a été ma compagne du début. Ça a commencé dans la joie et ça s'est fini dans la joie», dit-il ému. À cet instant, un journaliste étranger visiblement excité l'accoste. «Beautiful job!», lui dit-il. «C'est une belle naissance, une histoire heureuse, mais je ne prends pas trop de mérite là-dedans», répond Girard. ZED est une production impliquant 70 artistes, dont cinq Canadiens. Il s'agit d'un poème animé de 11 tableaux dont les personnages s'inspirent du tarot. Le spectacle s'inscrit plus dans le style de Mystère et de La Nouba. C'est l'humain avant la technique. François Girard reviendra à Montréal dans les prochains jours, non sans avoir fait un détour par Macao pour voir le spectacle de son ami Gilles Maheu. Il se rendra ensuite à Las Vegas le 31 octobre pour le prochain spectacle du Cirque, Believe, avec Chris Angel. Et cerise sur le gâteau, une compilation vidéo de la première ici (lecteur de FLV nécessaire). Shifts from movies and opera to a massive Cirque show in a land he much admires. TOKYO–"It would take a lifetime to understand Japan," says François Girard, "but I certainly have a love and fascination for Japanese culture and great respect for the Japanese people." The renowned Quebec director of movies like The Red Violin and Thirty Two Short Films About Glenn Gould is sitting in the lounge of his hotel earlier this month, a few hours before the opening of his current venture, the latest show from Cirque du Soleil, called Zed. Too wound up with excitement to eat, he smokes incessantly, sips at some mineral water and thinks about the all-important premiere a few hours ahead. Three years of work and millions of dollars have gone into the creation of this piece, but besides the normal risks that go along with any production, this one has to be special. "It's the first show Cirque has ever created in Japan, for Japan," explains Girard, "and as a mutual point of honour, both the management of Cirque and the people of Tokyo want it to be extraordinary." Girard smiles nervously. "Wait until you see the show tonight with the Japanese public. They are such a brilliant audience. They are attentive, generous, focused, very sophisticated. "You know, I feel that the director always has to sit in the theatre and pretend that he is the audience. Trying to look at my own work through Japanese eyes was a privilege and a pleasure." Zed would prove to be a triumph, but how did this complex, multinational, multicultural project begin? Like most things do, with a phone call. "Gilles St-Croix (Cirque's vice-president of creation) called me," recalls Girard, "and said `Would you like to direct one of our shows?' I was instantly excited because I love theatre and this would be a great opportunity to play on a big scale with such a prestigious company. "Then I became doubly excited, because they told me the show was going to be in Tokyo." It was a total coincidence, because the Cirque management didn't know at the time that Girard was deeply immersed in the study of Japan preparing for his movie Silk, which starred Keira Knightley and opened at the 2007 Toronto International Film Festival. "I was filled with Japan, its sights, its sounds, its culture, its people, and when this offer came it seemed so right, so destined to be that I did not hesitate a moment before accepting it." Once Girard was signed to do the show, "I went to see all the Cirque shows that I could around the world. It is such a brilliant world that they have created and I wanted to remind myself of what they had done and think about what I could bring to the equation." But when it came time to put together what they call "the acrobatic skeleton" of the show, Girard discovered that he had to make major changes to his own style of creation. "I am a storyteller," he shrugs. "That's what I normally do in all my work. I had to pull away from that here because Cirque is not a narrative medium. I had to learn to be fluid, to turn more towards the world of characters." And in searching for that world, Girard came upon the Tarot, using the figures from its deck of cards to people his imaginary world. "Of course, we picked the Fool as the lead character," he smiles. "He is either the first or the last card, so we went with the last and called him Zed. "We all liked that so much we made it a working title and it just grew on us, so we never changed it." Despite the tremendous amount of time involved and the pressure of a multi-million-dollar budget, Girard praises the Cirque management "for the gift of freedom they gave me." "The only condition I was given from the start was that it should be primarily an acrobatic show, so I have been working on making those magical artists shine." When asked how one moved from film to opera to the world of Cirque, Girard shook his head. "In many ways it is all the same. I have to make possible the dialogue between the audience and the performers and I am at the service of both. ``It doesn't matter if it's an actor, an acrobat or a heldentenor. "This is not about François Girard here. This is about making theatre come to life. I'm interested in creating possibilities. I go from piece to piece, happy to discover, happy to learn." Journey toward Cirque du Soleil's new "Zed"
URAYASU, Chiba--The Cirque du Soleil staff made the ZED Grand Open Gala Premiere on Oct. 1 look like something they do every day. From the backstage tour with writer and director Francois Girard and designers patiently waiting to share their thoughts, to last minute double-checking guest lists, the multinational and multibillion-dollar company knows how to prepare for an opening. Fans of Cirque will notice they have a prescribed formula for success. ZED is no exception. It offers nail-biting anticipation, beautiful entertainment and the overwhelming awe of watching acrobatic artists in their prime. ZED is a journey through the underworld. Based on characters drawn from the tarot deck, the acrobatic show is a delight, and is inspiring and moving. Design concepts stem from the Renaissance-era stargazing instrument known as the astrolabe. Red carpet special guests included all the big names from the worlds of entertainment, fashion and sports. The list included fashion designer Jun Ashida, Beijing Olympics judo gold medalist Ayumi Tanimoto, TV personality Dave Spector, actor Shun Oguri, Dragon Ash's Atsushi, the members of J-pop group TRF, musician Hideki Togi and graphic designer Sato Kashiwa. The lobby of the new white structure that houses Cirque du Soleil Theatre Tokyo has a facade of glass imprinted with Cirque's signature sunburst face. Polished steel in white with gray tones and that new paint smell eagerly awaited guests. For the ceremony, cloudy skies broke with bursts of late afternoon sun that chased the chilled autumn air. Cirque du Soleil President and Chief Executive Officer Daniel Lamarre spoke of the elusive fire-eating founder Guy Laliberte's respect for Japan. Lamarre said: "Early in Laliberte's travels, he thought Japan was a fascinating country. He knew Cirque would find a special place in Japan. "This theater is a jewel between partners Oriental Land Co. and an accomplished relationship with Disney. It is a special journey, and we thank them for their trust." Truly, a great trust must exist between Cirque and Walt Disney Enterprises, as the theater is situated inside Tokyo Disney Resort. Disney's partnership with Cirque began in Orlando, Fla., in 1999 with its first resident show, La Nouba. This year, Tokyo Disneyland is celebrating its 25th anniversary. In a speech, Head of International Development and Walt Disney Attractions Japan Nick Franklin said, "It's just the beginning." Indeed, the ZED contract is for 10 years. Founded in 1984, Cirque is a showcase for all human circus acts. According to Girard, who also was involved in the Montreal art scene at the time of Cirque's conception, the Canadian prime minister donated money to the troupe to help with the first tour. "We knew it was something special," he said. "Guy kept the tour going in spite of storms, electrical problems, everything." Since then, Cirque has taken its big tops to 200 cities worldwide. Currently, seven productions are touring with nine in residence. At Las Vegas's Luxor, the circus will open illusion-based show Criss Angel Believe on Nov. 1. Dubai and Los Angeles are each slotted to open theaters in 2010. In these days of economic uncertainty, Cirque is optimistic and undaunted. It appears they believe the motto in their promotional video: "Impossible is only a word." Girard, who is known for his bold concepts in theater, film and opera, started his career on the Montreal art video circuit. He won international acclaim with Thirty Two Short Films About Glenn Gould (1993). Tarot images also make an appearance in his film The Red Violin (1998), which is about the ownership of a violin over the centuries. This movie won an Academy Award for Best Original Soundtrack and 13 Genie Awards. "I'd seen two Cirque shows before, and Gilles Saucier asked me to direct in Tokyo. I was over the moon. At the time I was working on the script for Silk. I had a connection with Japan already and Chinese work, too. It was a karmic connection. "Cirque has gathered resources, sources, knowledge and an extreme sense of poetry you cannot see anywhere else. They have established a great acrobatic theater. I got even more excited. "Early on, I had a discussion with Guy and we wanted a show where the culture is a world culture, so we didn't put Japanese elements in it. "I wanted it to be about characters instead of a plot. Tarot gave me a set of characters to play with to start." It is from this concept that the main characters, Zed, Shaman and Djinn, along with Abraka, Kernoon, Noiut, Erato and Toth, were born. Tarot card games entered Europe in the 14th century and were not originally associated with divination. According to Girard, tarot offers reflection of the human experience. "It is all of our experiences on Earth...condensed into 20 major symbols. "When I started working with the artists, there where 10 numbers." These formed into several scenes including: Russian banquine, Japanese baton twirling, poles and trampoline, Bungee and aerial hammock, South American flying trapeze, Israeli clowns, Russian aerial straps, Chinese lasso, Russian juggling, high wire, hand-to-hand, and North American musicians. With these Girard aimed to go beyond boarders and disciplines. "I conceived the show and ideas before I met the artists, however it is written with the body of the artists and acrobats. They are the [heart] of the show. It says written and directed by Francois Girard, but there are so many people that put into this show. "Guy and Gilles gave me space up until the end. I never felt restriction or censorship. I think that says a lot for Cirque, despite being a global company." Girard's first idea was to create an acrobatic show in the style of Mystere and La Nouba. He had experience in plays, opera and film on both small and large-scale productions. "I had to learn everything--like trapeze artists: What does he need? How does he work? My first duty is to support the artists, then bring layers to the show." Girard is humble and generous in recognizing ZED's creative team. In particular, he credits Line Tremblay, creative director. Girard says, "She was imperative for my work with Cirque. She was a day-to-day companion. We've been very close with decisions. She knew everything that I didn't know. This show owes a lot to her. She has a lot of respect for the artists and me as a director." The creative team was a balance of Cirque veterans and newbies. Composer and arranger Renee Dupere brings experience in his music. Girard says, "Choreographer Debra Brown saved me from making mistakes many times." American David Finn designs lighting. Renee April designed 150 costumes. After the show premiered, April smiled and proclaimed ZED "a healthy baby." Set Designer Francois Seguin said: "There was an acrobatic number list and the story the director wants to tell. We came up with ideas. I wanted to fill the arch, the whole theater. I started with a circle drawing." For Seguin, the circle represents the Earth and sky. "At one point in the emotional story, [the images] connect and make a good metaphor." The creative team found its inspiration studying tarot and the Renaissance era. The set is based on the astrolabe, or star grasper. This helped astronomers, navigators and astrologers to locate and predict the position of celestial bodies. The result is Theatre Tokyo's four-story proscenium, with its rounded thrust. Brass, copper and steel surround the audience, bringing the spectators inside the machine. Acrobatic performance designer Florence Pot explains the care given to ZED's human stars. Three therapists are on the staff to counsel on injury prevention, massage, mental care and physical testing. Pot said there was good communication between the coaches and physiotherapy team. "With ZED we were very cautious to deal with the workload of the artists." As a result, there have been no injuries so far. Pot calls Girard's initial vision operatic, adding: "He prefers some acts, but we try to influence it so there will be a different emotional balance, energy, rhythm. We try to offer something that will surprise, not be the same." Scott Osgood, acrobatic equipment and rigging designer said, "ZED's rigging is a sophisticated system that is simple at the same time." The most complicated part is the flying trapeze, which is set up in one minute. "I have never been afraid of technology. I have used it in my films, but try to make it invisible." Girard says. "All the rigging and set are run electronically, you can't avoid it. But the show's not about only the mechanics. The aim was to make the technology invisible to give the show the most human impression." Une vidéo sur le Gala d'ouverture est disponible ici.